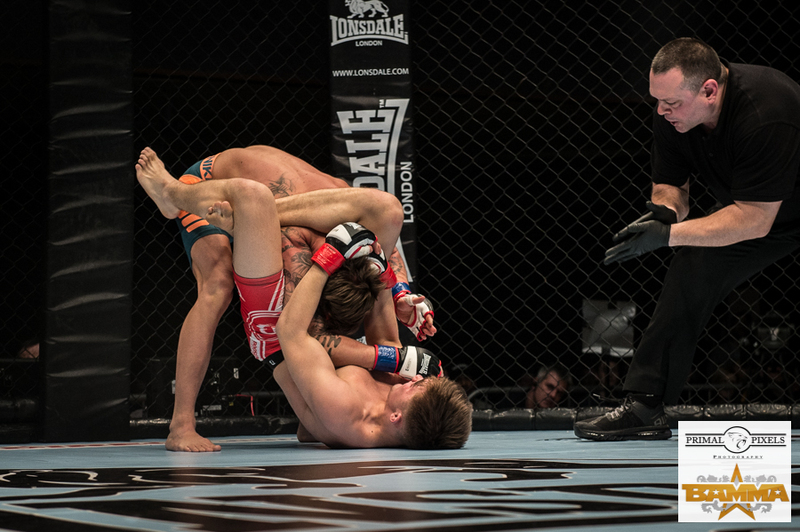 A submission by leg triangle in round one gave Regis ‘The First’ Sugden his second professional success in the cage on Saturday 21 February. The 19-year-old from Suggy’s Gym owned his opponent and a victory against a game Austrian Manuel ‘Sugar’ Bilic just over 40 seconds from the end of the first round in the Bantamweight contest on the card of BAMMA 18 in Wolverhampton. Regis, who won his MMA pro debut by TKO on BAMMA 17 in December, was quick to respond when Manuel threw the first kick a few seconds into the fight, anticipating the move and stepping just out of range before landing an explosive kick in return which appeared to hurt his opponent. Unsure whether Manuel was faking to lure him in, Regis attacked ferociously with a series of punches and knees to the head then, to the surprise of the crowd and the MMA pundits present, took his opponent to the ground where he began to pile on the pressure. As Manuel started to look for an arm, Regis calmly stopped him with great grappling and control. And, although Manuel eventually took Regis’s arm, the Suggy’s Gym fighter cleverly turned it to prevent any serious pressure on the elbow joint. Spinning out of it, Regis was instantly back in control despite being in an unusual position as he proceeded to strike while pinning down his opponent, who was folded over and on the receiving end of Regis’s hammer fist and strikes. Ever dangerous, Manuel looked to grab Regis’s leg but Regis rolled again and, after a split second on his back, turned and ended up on the back of his Austrian opponent. When an attempted rear naked choke by Regis slipped off, he was again turned over by Manuel who began to try and posture up as Regis had him in full guard. Breaking free as Regis grabbed his arms, Manuel attempted to throw an elbow at his opponent. But it was a move that was to prove his downfall when, slipping the elbow, Regis seized the arm and positioned for a leg triangle. Showing no mercy when Manuel tried to defend against his elbow strikes, Regis transitioned into a really tight triangle, leaving the Austrian with no alternative but to tap out after a few seconds. 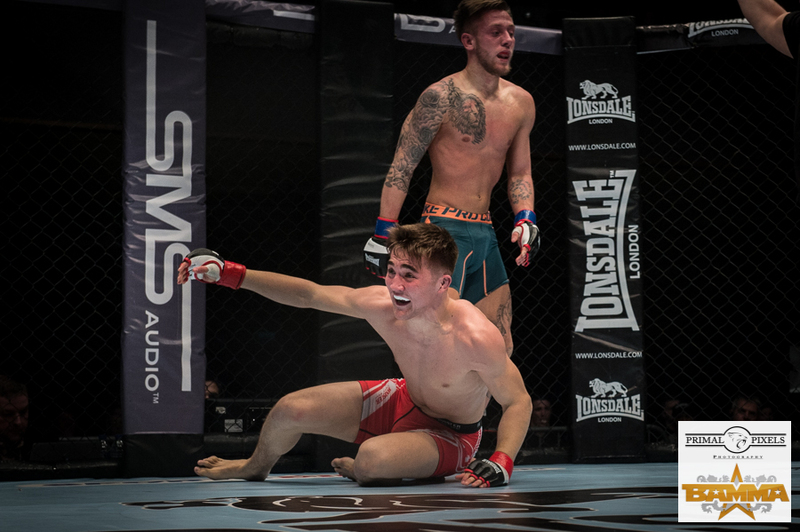 “I was absolutely delighted to win by submission, especially just over four minutes into the first round,” said Regis, who jumped onto the cage wall after the tap out to salute the army of fans who had travelled to Wolverhampton to support him. 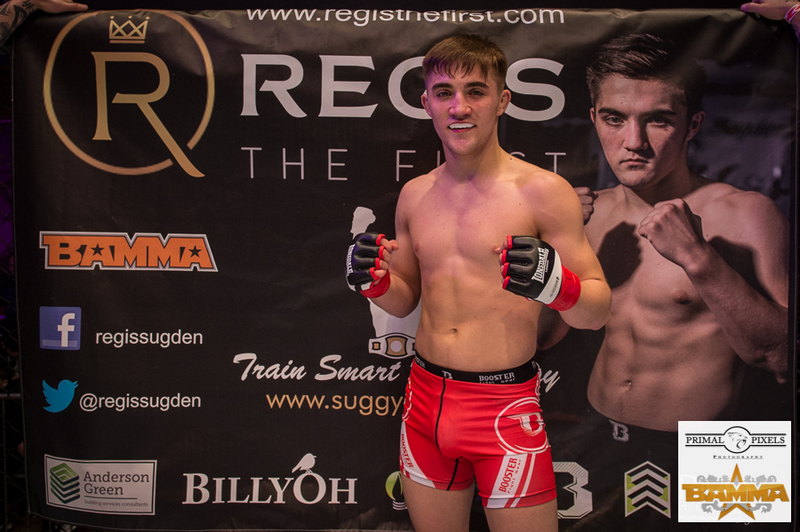 There was more praise for Regis from his MMA coach Jimmy Wallhead: “This kid has tremendous potential and a great attitude towards the sport, I love working with him.